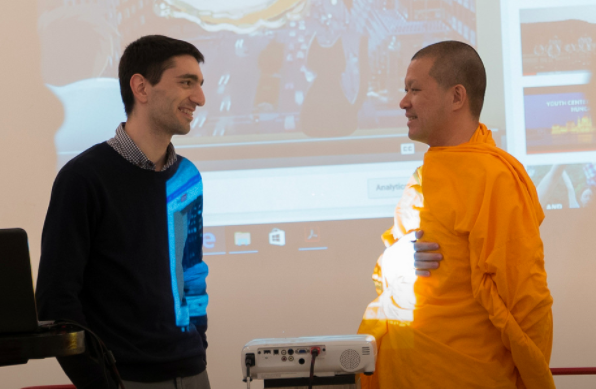 On March 19-22, 2017 World Peace Initiative Foundation (WPI) organised meditation workshops with a monk John Paramai from Thailand in Tbilisi. The workshops gathered almost 300 people and created a positive new vibe in the city. Meditation workshops were organised by WPI Regional Coordinator Kateryna Kulyk right after Bridge Peace Fellowship which took place in Rustavi, Georgia for the third time in 2017. Thai teaching monk was invited as a meditation instructor both in the Fellowship, as well as the preceding workshops. WPI Foundation promotes meditation as a practice of concentration and relaxation for the mind. It is a universal way of training the mind for everyone, regardless of their background, age, gender, nationality etc. Monk John talking to Tornike who was interpreting the workshop from English to Georgian. WPI cooperates with Thai monks to teach meditation. Monks follow a life of simplicity obeying 227 rules. This allows them to have more time and discipline to meditate. Teaching monk John, who has a PhD in Telematics from a Norwegian university, practices meditation minimum for four hours every day. Monk John compares human being to a computer – our body being similar to a hardware, and our mind – to a software. Even though we cannot see the software, it is the key element of a computer. Similarly, our mind operates our body and all of our actions and habits. Therefore, meditation is to be practised as the main method in gaining control over our minds. Why do you wear orange? Back in the days, monks lived in a forest and they would use old pieces of cloth in which corpses were wrapped as clothes. This fabric was normally white and dirty, and monks would pick it up and sew together, and then they would dye it using natural colour. Some say that Thai monks wear orange coloured clothes because they wanted to scare away wild animals. Some say that orange was the best and most accessible natural dye. What’s your relationship with women? When I became a monk, I renounced worldly life and accepted celibacy. I belong to Theravada Buddhism which is the most orthodox branch of Buddhism, and we are not even allowed to touch women. So since I became a monk, I am not even allowed to touch my mother. According to my master, the best time to meditate is two times per day – when our eyes are open, and when our eyes are closed (laughs). Generally, it is recommended to meditate just after waking up and right before going to sleep, but in my opinion time does not matter, consistency is more important. If you meditate every day at the same time, then you are more likely to get into the meditation routine. For some people meditating right after waking up is the best way to establish this habit. Can different approaches to meditation have a different influence on the body? Different methods of meditation are similar to different vehicles that all bring you to the same destination. When you go by car or bicycle to the same place, your ride will be different but you will eventually arrive at the same place. Therefore, different methods of meditation may bring about slightly different sensations, but their goal is the same, and the closer you come to stillness, the more similar your sensations will be. Do you recommend to listen to the music during meditating? It is ok to listen to music to relax at the beginning of the meditation, but it is better to switch it off eventually. During meditation we try to switch off all of our senses, including hearing, and music may remain as connection to outer world, preventing us from going deeper within. There were many more questions and two interviews on the media – with Radio Tavisupleba and Georgian Public Broadcasting; TV show “Communicator” by Studio C.
We have cooperated with Yoga Cave Tbilisi, Droni Youth NGO, and Fabrika. WPI is grateful to our partners Olga Ramer, Sopho Gogsadze and Anna Svanidze for allowing us to use their venue and inviting participants, to share meditation moments with as many interested Georgians as possible. 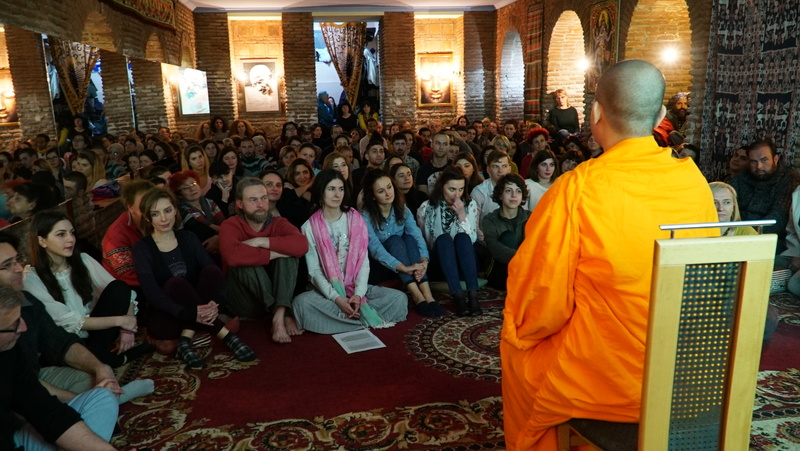 In total, 283 people attended meditation workshops with monk John in Tbilisi, and they received answers to many questions. If you would like to attend such workshops in your country, please follow WPI and Peace Revolution project on Facebook and Twitter and stay tuned in to events in your country. You are also welcome to start our free online self development program, during which your Peace Coach will answer all your questions about meditation, monks and opportunities with WPI.